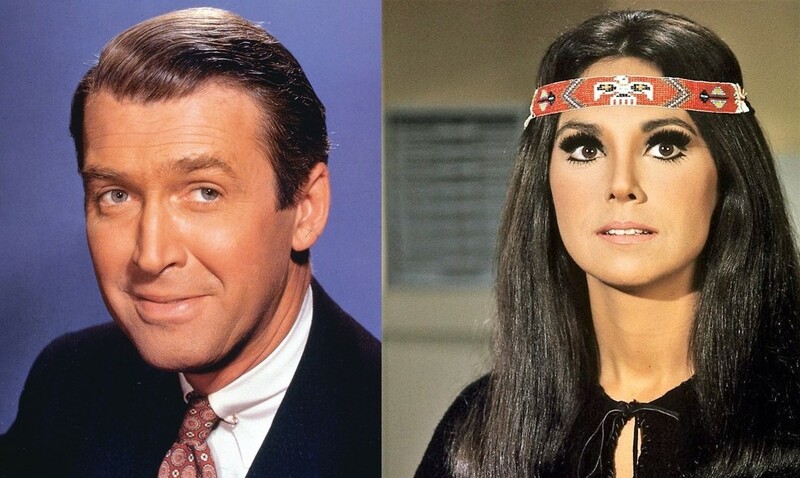 James Stewart and Marlo Thomas. With spring just around the corner, it must to be time to play this blog's most popular game! If you're new to this game, here are the rules: You will be given a pair or trio of films or performers and will be required to to find the common connection. It could be anything--two stars who acted in the same movie, two movies that share a common theme, etc. As always, don't answer all the questions so others can play, too. There is a single best answer for each question. 1. Batman TV series and the movie Seven Brides for Seven Brothers. 2. Nigel Bruce and Joanne Woodward. 3. Robert Taylor and Cornel Wilde. 4. Ronald Colman and Don Adams. 5. Howard Keel and Richard Dean Anderson. 6. James Stewart and Marlo Thomas. 7. Paul Newman and Frankie Avalon. 8. Shirley MacLaine, Muhammad Ali, and Sophia Loren. 9. Clifton Webb and Marilyn Monroe. 10. Walter Matthau and Tony Curtis. 11. Robert Mitchum and Gabe Kaplan. 12. Boris Karloff and Buster Keaton. 13. Lee Van Cleef, Yul Brynner, and George Kennedy (answer must be specific!). 14. Angela Lansbury and Helen Hayes. 15. Lionel Barrymore and Christopher Lee. 2. Dr. Watson. Bruce in a series of films and radio programs, and Woodward in They Might Be Giants as psych doctor to slightly mad George C. Scott who thinks he is Holmes. 14. Miss Marple is in the house! As usual, you have gotten this month's game off to a rousing start! 6. Marlo Thomas played the equivalent of George Bailey in a TV remake of It's A Wonderful Life. 11. Both played basketball coaches, Mitchum in That Championship Season and Kaplan in Fast Break. Well done, Jerome! Not many people have seen Marlo's remake. Great job...the TV show didn't last very long! 10. Both starred in Little Miss Marker. That is true, but there is also another connection. Nicely done! Personally, I'd want someone more handsome to play me in my movie biography. 13. All three men played the role of Chris Adams in the Magnificent Seven movies. Brenner was the original in The Magnificent Seven, George Kennedy took over in The Guns of the Magnificent Seven, and Lee Van Cleff took over the role and The Magnificent Seven Ride. Well done! I love the original MAGNIFICENT SEVEN (and Kurosawa's film), but the sequels are only fair. Questions still needing answers: 2, 4, 7, 9, 10, 12, and 15. 10. Both in Bad News Bears films. 12. Boris appeared (on the Union side) in Buster's The General. I didn't think of this in the morning because I was tired. However, the game occupied my mind during a boring bus ride to a boring meeting. I couldn't wait to get home! Oh, wait. Could I be getting too fancy? After all, I don't "know" that Boris is in The General. It's just something my sister mentioned once. Is it Beach Party movies? The Ghost in the Invisible Bikini and Beach Blanket Bingo, and like that? I was thinking of the BEACH PARTY movies, but now I need to go look up THE GENERAL! Number 9: Both played babysitters: Clifton Webb in Sitting Pretty (1948) and Marilyn in Don't Bother To Knock (1952). 4 Don Adams did a parody of Ronald Coleman in "The Prisoner of Zelda" in the "Get Smart" episode "The King Lives". Only three questions remain: 3, 7, and 15. Yes, that rascally mad monk! Well done, beachgal. SWORD OF LANCELOT was my first exposure to the love triangle and sent me to the encyclopedia to confirm that Lance could have done such a thing. No. 7 is all that remains! You’re spot on, Bill! Thanks to everyone who played this month.